Almost 30 experts from 25 partner organisations met in Bolzano, Italy, on 21 and 22 March for the kick-off meeting of IEA SHC Task 56, Building Integrated Solar Envelope Systems for HVAC and Lighting. The overall goal of the task is to find out “why some ways of solar integration do work, while others don’t,” as the Task Operating Agent and Coordinator of the Sustainable Heating and Cooling Systems research team at Italian institute EURAC, Roberto Fedrizzi, put it – and, of course, to find measures to improve solar technology integration into façades and roofs. 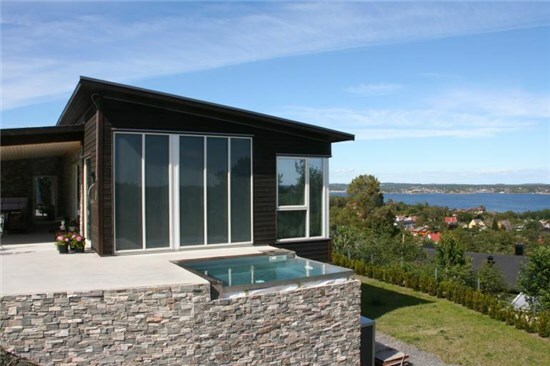 The photo shows a residential home in Stavern, southern Norway, where 7 m2 of solar collectors have been integrated into window frames in the south-facing facade, contributing to both domestic hot water preparation and space heating. The task covers the entire field on the use and control of sunlight by the building façade. This includes natural lighting and shading technologies, as well as energy usage for heating, ventilation and cooling (HVAC) by solar collectors and photovoltaic systems. The expression “building integrated solar envelope” was chosen because both the facade and the roof could be used for the technology. The focus of the task will be on evaluating how active and passive building integrated solar results in improved comfort and energy performance by way of the buildings’ HVAC system. The task was launched in February 2016 and will run until January 2020. So far, 12 countries have been participating in the new task: Austria, Canada, Denmark, Germany, the Netherlands, Italy, Norway, Slovakia, Spain, Sweden, Switzerland and the UK. Besides architects and construction companies, Fedrizzi intends to address public and private investors, such as housing companies, banks or public bodies, as well as solar technology producers and manufacturers of building envelope systems. “After the kick-off meeting, the first item on the to-do-list is to gather information about the state of the market,” Fedrizzi said. This market overview is listed on the task´s concept document as activity A1 under Subtask A, Solar envelope systems classification and communication, headed by Michaela Meir from the Norwegian manufacturer of solar facade elements, Avanta. Standards, test methods and numerical tools for all kinds of solar building envelopes will be put into categories in Subtask B, Performance Characterisation of Solar Envelope Elements, led by Christoph Maurer from Fraunhofer ISE, Germany. Over the course of the task, the project members will analyse the strengths and weaknesses of the different approaches. These analyses will not only consider technical and economic aspects. Business strategies of manufacturers will also be examined: To whom are they selling their products? How do they approach their customers? Which sales arguments do they use? As solar envelope elements have to be integrated at an early stage of construction planning, it is necessary to employ a comprehensive planning and simulation tool. Subtask C, Assessment of solar envelope systems at building level, intends to develop a pre-design tool to enable simplified calculations of the effects of solar facade elements on the building. The tool will be based on the existing simulation software package Passivhaus Planungspaket (PHPP), which was developed at the German Passive House Institute and is used for planning houses with very low energy consumption (passive houses). Subtask C will be led by Fabian Ochs from the University of Innsbruck, Austria. This PHPP program will receive additions of new models of subsystems, which will be developed within subtask B.